When Express set out to recruit the newest class of Game Changers, there were some key traits we kept an eye out for: a distinct sense of style, outstanding character, boundless swagger, and the ability to truly make an impact on the game. Victor Oladipo, Indiana’s celebrated point guard, checks all those boxes and then some. The seasoned NBA vet, who’s going into his sixth season, has faced a decent amount of adversity on his journey to the top, including enduring two trades within a single year. But obstacles like that aren’t a setback in Oladipo’s eyes. They’re just more fuel for the fire. Last season, Oladipo made an impressive effort in a gripping seven-game series against the defending Eastern Conference champions during Round 1 of the playoffs. Despite falling just short of victory, his team would go on to garner heaps of respect from fans and players alike, with Oladipo earning the NBA’s 2017-2018 Most Improved Player Award in the process. It’s safe to say that everyone will be watching Oladipo as the season kicks off. 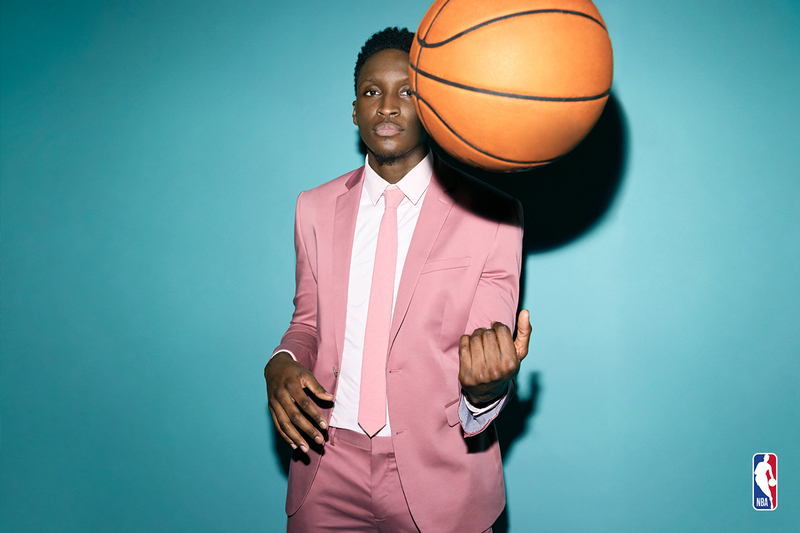 We caught up with the newly appointed Express Game Changer to find out how he continues to maximize his performance, what he loves most about basketball, and the secret to his all-star style. “I’m unique. My background is unique as a first-generation Nigerian-American. My time in the NBA has been unique—from being traded twice in a year to becoming an All-Star last year. I’m more hungry now than I’ve ever been in my entire career. So, I think bring a lot to the table. But I think the biggest thing for me is to be someone people can relate to. Hopefully when they see the way I dress and my story, they can connect with it. I want to show them that they can do whatever it is they want to do. “I try to do whatever I can to set the tone and set an example for my team. For the most part, I know I’ve got to bring it night in and night out. There can never be a day where I’m lackadaisical because they’re dependent on me and they’re looking at me, seeing what they have to do. At the end of the day, they’re great teammates and they’re professional and they work really hard. When they see me working hard, it’s hard not to work hard, too. Without them I wouldn’t be who I am today and I wouldn’t have the success I’ve had or will have in the future. “What I love most about the game are those pressure moments. I thrive off of them. Whether, it’s good or bad, whatever that pressure moment is I can take it. That’s what you play for, right? “My style has gotten totally better. When I first got to college, I didn’t even know how to wear clothes. As I get older, it’s funny how I started to realize what I like and don’t like. I would describe my personal style as simple, but with a twist. It’s a subtle extravagance. It’s the little things that you might not notice.